There are more than 200 social networking sites currently active across the globe, hosting trillions of conversations. Over the past few years, businesses have begun to harness the power of these networks to talk about their brands, engage customers and for incremental sales. This week, JAM launched the first ever Employee Motivation Day for our client Argos for Business We achieved some fantastic pieces of trade coverage (51 pieces so far, in fact – not that we’re bragging) and our client was interviewed on eight different radio stations. But it was the impact the campaign created on social media that we’re most motivated by (see what I did there?). I spent the majority of Wednesday tweeting, re-tweeting and social media stalking. It was heartwarming to see so many businesses and individuals getting on board with the campaign. The Black Hole took the company out for a team lunch, the employees at Stopgap were given sweets and Papa John’s encouraged bosses to buy pizzas for their teams to share. Argos for Business provided cups of tea and coffee in #emd branded mugs and our lovely MDs, Jaime and Dave Gee, gave each Jammer a gift of chocolates, flowers and Prosecco! Incorporating a strong social media presence for a brand as part of a PR campaign is essential in terms of maximising exposure for a client. We started the Employee Motivation Day social media channels from scratch and there are now around 2,500 followers across both Facebook and Twitter. The reach on Twitter this week alone currently stands at 1,436,539. Overall, we have achieved a social media reach of over 9million! Thanks to everyone who tweeted, followed, re-tweeted, liked, shared and posted! Hopefully you’ll be back next year to celebrate Employee Motivation Day 2016. While most of the nation is still settling back into the nine to five JAM has been putting the final touches to our latest campaign – the UK’s first ever Employee Motivation Day. Launching today, for our client Argos for Business, #emd is delving into employee motivation levels to help employers find out what makes us tick. To kick off the campaign Argos for Business, the leading provider for corporate motivational solutions, has unveiled the results of national research into the nation’s motivational habits – revealing that ‘feeling valued’ by their boss is the top motivator helping Brits achieve at work. Other figures from the research revealed that 3pm is the nation’s humdrum hour and that 10am on Wednesdays is when we’re at our motivational peak. The full results of the research are being used to highlight the importance that motivation plays on employees, and the practical things that employers can do to achieve the best from their workforce. To help give a voice to the cause, we’ve also partnered with motivational expert, Adrian Webster, who is joining Argos for Business’ MD, Danny Clenaghan, for a series of targeted radio interviews broadcasting all day. A well-rounded campaign (if we do say so ourselves), #emd has also seen JAMpr working hand-in-hand with the JAMcreative team to create a brand identity for the national day, including logos, image collateral, campaign microsite, video and downloadable content – which has already seen hundreds of businesses downloading the material to take part. In the run up to the campaign JAM has been busy building a buzz via the day’s official Facebook and Twitter pages, driving engagement with motivational content and competitions. 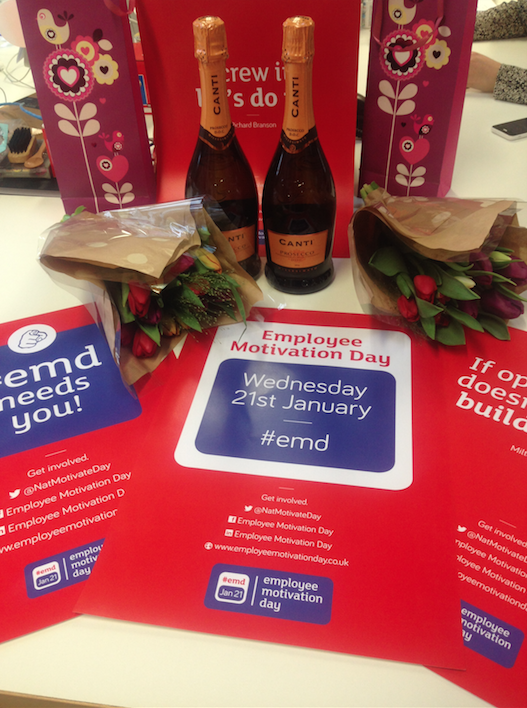 Designed to allow employers and employees to say thank you, for a job well done, #emd is encouraging hard-working Brits up and down the country to engage with the Facebook and Twitter pages, using the hashtags #emd, #EmployeeMotivationDay and #NatMotivateDay to nominate their boss or employee for a job well done. As a team we’re celebrating with motivational treats (thanks Mr and Mrs Gee!) and as Adrian recommends, Starbucks coffee all round. Happy New Year one and all! Niamh here, resident Account Exec and brand new Jammer. As the newest recruit of JAM towers, I thought it might be sensible to scope out the “ones to watch” in the social media world. One of my new year’s resolutions is to be much more active in the Twittersphere, but how embarrassing would it be if I’m firing/ tweeting on all canons as the rest of the world has vacated to the next big thing? Branding itself the ‘anti-Facebook’, this is basically Facebook without all the ads, run by some hipsters that know how to make a website look pretty cool. Apart from feeling like a bit of a grandma that’s stumbled in to ‘yoof’ territory on the homepage (‘Simple, beautiful and ad-free’ – modest bunch aren’t they? ), I have to hold my hands up and say ads aren’t really holding me back from enjoying my daily browse of the old FB newsfeed. More troubling are the tragic status updates posted by people I have actually friended. Reckon they’ll invent a platform that filters that drivel for me? Throwback to ten years ago when your mum wouldn’t let you ‘surf the web’ for fear of you stumbling in to the dreaded CHATROOM. Well, it seems that said chatroom is making a bit of a comeback, except this time it’s to help us with our productivity at work rather than to connect us with traffickers and pond life worldwide. Slack wants to revolutionise internal communications for companies by letting you share files, comments and instant messages in one big online space. From the co-founder of Flickr, sounds like it could be worth a look. As a self-confessed gym-phobic, I’ll try my best to stay objective on this one. It’s social media for fitness fanatics and aims to transform getting fit into an online game. So we’re talking, beating challenges, reaching next levels and sharing this information with everyone in your fitness circle as you go. Hey, if it means my Facebook is no longer populated by gym mirror selfies and ‘check dem gainz’ posts, I’m all for it.